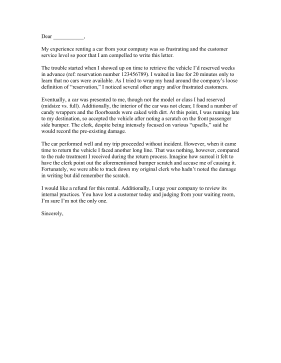 Complain to a rental car company for erroneous charges and long wait times with this sample complaint letter. My experience renting a car from your company was so frustrating and the customer service level so poor that I am compelled to write this letter. The trouble started when I showed up on time to retrieve the vehicle I'd reserved weeks in advance (ref: reservation number 123456789). I waited in line for 20 minutes only to learn that no cars were available. As I tried to wrap my head around the company's loose definition of "reservation," I noticed several other angry and/or frustrated customers. Eventually, a car was presented to me, though not the model or class I had reserved (midsize vs. full). Additionally, the interior of the car was not clean; I found a number of candy wrappers and the floorboards were caked with dirt. At this point, I was running late to my destination, so accepted the vehicle after noting a scratch on the front passenger side bumper. The clerk, despite being intensely focused on various "upsells," said he would record the pre-existing damage. The car performed well and my trip proceeded without incident. However, when it came time to return the vehicle I faced another long line. That was nothing, however, compared to the rude treatment I received during the return process. Imagine how surreal it felt to have the clerk point out the aforementioned bumper scratch and accuse me of causing it. Fortunately, we were able to track down my original clerk who hadn't noted the damage in writing but did remember the scratch. I would like a refund for this rental. Additionally, I urge your company to review its internal practices. You have lost a customer today and judging from your waiting room, I'm sure I'm not the only one.